1) What are the current mobility trends into, out of, and within China? 2) Are we seeing any evolution in how companies address employee development? How are they focusing on developing local talent? 3) Last year, environmental concerns were a top-ranked challenge to sending expatriate assignees into China. How do they rank this year? 4) Most responding companies indicated that they have no formal mobility assistance policies for domestic moves within china. What factors are discouraging implementation? 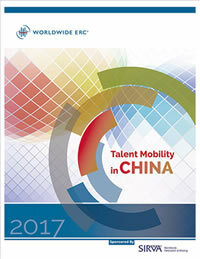 Companies generally expect mobility into, out of and within China to remain stable in 2017. This finding may reflect companies’ uncertainty about their economic prospects. Our Insights section discusses how China’s complex economic picture, combined with uncertainty about China’s economic policies, treatment of non-Chinese companies, and leadership transition as well as a dynamic global political atmosphere, all combine to make many multinational companies less confident about their prospects in China. Worldwide ERC® partnered with survey sponsor SIRVA Worldwide in November 2016 for this survey and 116 companies responded, representing 31 industries.